Thrust and rotation strategy to circularize a standard GTO orbit using ion propulsion? The previous question How much time does it take to circularize a GTO orbit using ion propulsion? has a good, quantitative answer based on a known delta-v. But I'm wondering how would you actually aim a continuous ion thrust as you move around in a highly elliptical orbit at the beginning? Is there a way to do this without wasting a lot of propellant? Or do you use the thrust only during a fraction of the orbit (in the beginning) when near periapsis, and therefore it takes longer to accumulate the delta-v because the thruster is actually turned off a lot of the time? Here's a quick, silly calculation showing that for 0.2N and 2200kg, starting at 300km LEO, it takes about 600 days to slowly spiral out to GEO. The satellite rotates once per revolution around the earth, so I have to slow down the rotation rate a teeny tiny bit once in a while to keep them synchronized so the thrust is always tangent to the circular orbit. Now suppose I want to start from a standard Hohman transfer ellipse (GTO), and run my program again. Periapsis altitude 300km, apoapsis at GEO. Let's assume there's nothing else at GEO to collide with to make it simple. Q1: In order to use the least amount of ion propellant, should the spacecraft be slowly rotating, or have a fixed attitude, perhaps tangent to apoapsis? If rotating, at a constant, or ramped rate? Q2: How would one modulate the thrust and attitude to circularize a standard elliptical GTO using the 0.2N ion propulsion in the least amount of time? print "period (min) ", T/60., " at ", alt, " km altitude." t    = days * 24. * 3600. TL; DR: Trajectory optimization for continuous thrust is difficult and this field is very active in research. Edit: Concerning the rotation of your spacecraft, you'll want to plot the in-plane and out-of-plane thrusting angles (with respect to the RNC frame of the spacecraft). That will give you an idea of how much the engines needs to gimbal by before thrusting. That angle depends entirely on what orbital parameters you're changing (cf. Naasz, Ruggiero and Petropoulos control laws). I expect that angle to not vary by much throughout an orbit correction, but I may be wrong (hopefully will have an answer soon). This expectation is based on the equations which perform the instantaneously optimal correction of each parameter, cf. figures 4 and 5 at the bottom. If using continuous thrust, you'll generally want to solve the optimal control problem. 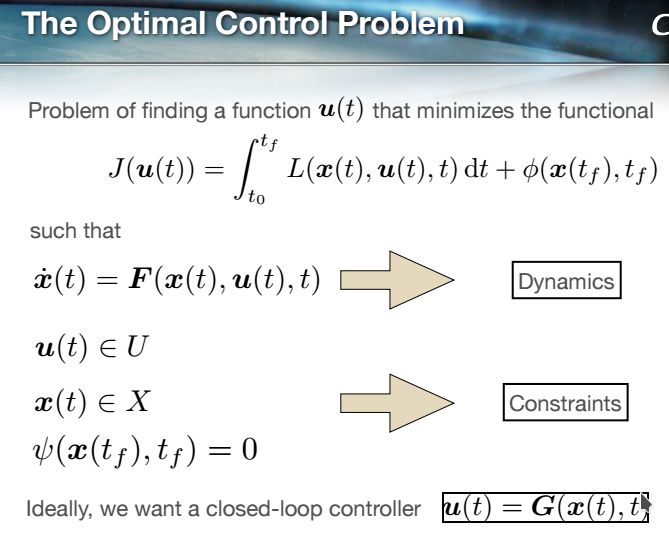 When solving an optimal control problem, you're minimizing a functional, i.e. you're searching for a function (the control) which will minimize your cost function at each time step (cf. screenshot of my group's presentation below). There are different ways to solve the optimal control problem for low thrust trajectory design, and (as often, sadly) each group of researchers is somewhat silos. From the (unpublished) research that two colleagues and I did, there are a few strategies to solve this, which I summarize below. All but the first one solve an optimal control problem. The simplest: use a sub-optimal closed-loop control law (like the Petropoulos Q-Law) which is fed to an optimizer like a genetic algorithm. This leads to a sub-optimal solution for the trajectory but is often very close to the optimal solution. All you need is to code up the Q-Law and the GA and define an initial and final orbit. Other controls worth checking out include Naasz and Ruggiero (but note that the initial formulation for the Naasz control was only validated on cases when you want to increase the value of an orbital parameter, and you need to perform a slight change in the equations to make it work the other way (I can provide the info if needed, I validated the changes in my own research)). The most theoretical and math-heavy method: the indirect methods, which solve the two point boundary value problem by finding the Hessian. Requires the initial and final conditions desired. There are several such methods, mostly started by Betts in 1998, including Direct Shooting, Indirect Shooting, and used more recently, indirect collocation. One of the issues you'll encounter is the selection of the initial Lagrange multipliers, knowing that a poor choice may prevent convergence. In addition, these methods lead to open loop solutions. Direct methods: time is discretized and at each step you're trying to find the best control. This is also an open loop method, and because of how the problem is posed, you encounter the curse of dimensionality (cf. Lantoine 2012). Yet, this is considered by some as the state of the art of trajectory optimization (cf. 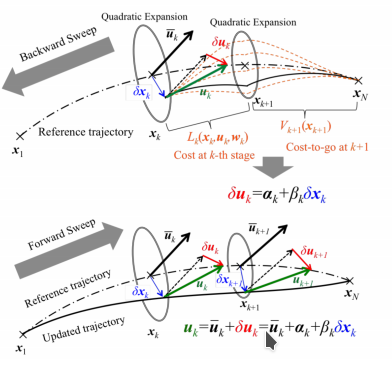 "Spacecraft trajectory optimization", Conway 2010). A better way: dynamic programming: the idea here is the split up the problem into simpler independent problems (a "divide and conquer"-like approach) and apply the principle of optimality (Bellman's graph traversing principle where the shortest path from a to c corresponds to the shortest path from a to b and from b to c) (cf. figure 2). The main drawback here is that splitting up the state space into independent sub problems means that you're going to be using a ton of memory to store the ongoing solutions... and then you'll need to traverse this graph. The main advantage though is that you'll always find the global optimal solution, and the returned functional is a closed loop control. Differential dynamic programming: this isn't a very new method per se, but it's definitely gaining tracking again in recent history. Specifically, it is used in NASA Mystic which does the trajectory optimization for the Dawn mission (which has three Safran PPS-1350 but only one turned on at each time, it's a pretty cool mission). The idea of this method is to pick an initial guess for the control, propagate the (real) dynamics forward, compute the cost, perform a correction of the control by propagating backwards (but using a quadratic approximation of the dynamics (i.e. you'll need the state transition matrix and the Jacobian of the STM too, which is the Hessian of the dynamics)), and finally check if you're minimizing the cost function by propagating forward again (cf. figure 3). The references you'll want to check for this method include Liao 1991, Pantoja 1988, Lantoine 2012, Ozaki 2015, and eventually Aziz 2016 (for an explanation of Hybrid DDP). Not the answer you're looking for? Browse other questions tagged orbital-mechanics geostationary hohmann-transfer python ion-thruster or ask your own question. Going from LEO to lunar using only low-thrust ion propulsion - can it be done? How much time does it take to circularize a GTO orbit using ion propulsion? What is the lowest altitude that an ion thruster can be used for station keeping? What are the travel times associated with different low-thrust accelerations going to Mars? General guidelines for modeling a low thrust ion spiral? Descending into any orbit: Which requires less delta-v, a wide one, or a narrow-elliptic one? Prograde/retrograde vs radial/antiradial burn - why are the former so much more common? CZ-5 plus YZ-2 put SJ-17 in GEO - third stage or separate spacecraft? Optimal change of argument of periapsis? Are patched conics (and by induction, KSP) “useless” for simulating ion propulsion?